The Danish economy is expected to rebound further, with a 1.8% expansion forecast for 2015 as private consumption and investment growth accelerate and export growth continues. 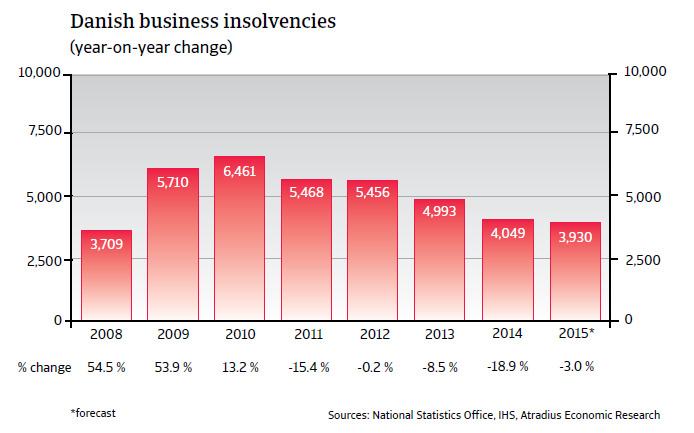 Danish business insolvencies decreased four years in a row, and in 2015 another decrease is expected, as the economic rebound gains momentum. Since the sharp recession in 2009, when GDP contracted by more than 5%, the Danish economy has yet to find its way back to sustainable growth. The real estate market was hit so badly during the global credit crisis – with house prices dropping by 20% – that only Spain and Ireland surpassed it in terms of lost value. This was followed by a crisis in Denmark’s banking system and the loss of 170,000 jobs, mainly in the manufacturing sector. With private households having to tighten their purse strings, private consumption has remained subdued over the last couple of years. Meanwhile public spending has been tightened to control the government deficit and various support packages designed to stabilise the financial sector and to ensure that Danish businesses have access to financing were implemented. 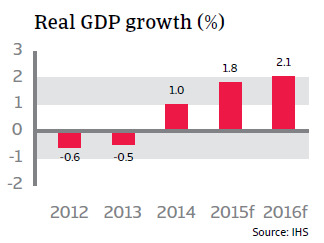 In 2014, GDP growth finally increased again, up 1.0% after two years of contraction. 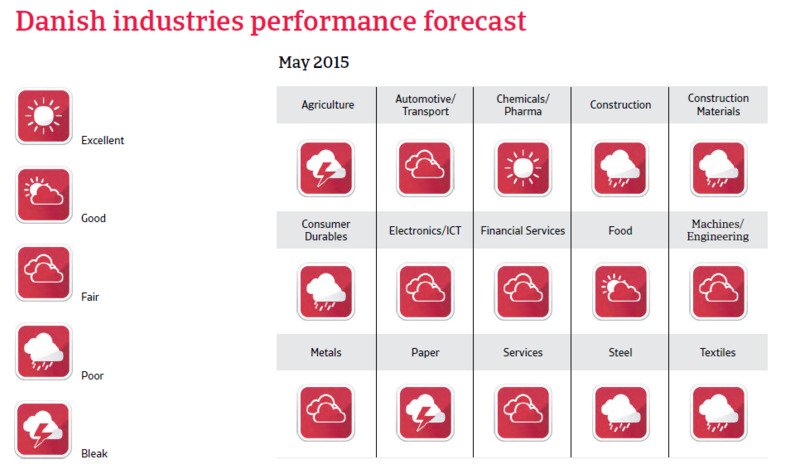 The Danish economy is expected to rebound further, with a 1.8% expansion forecast for 2015 as private consumption and investment growth accelerate and export growth continues. 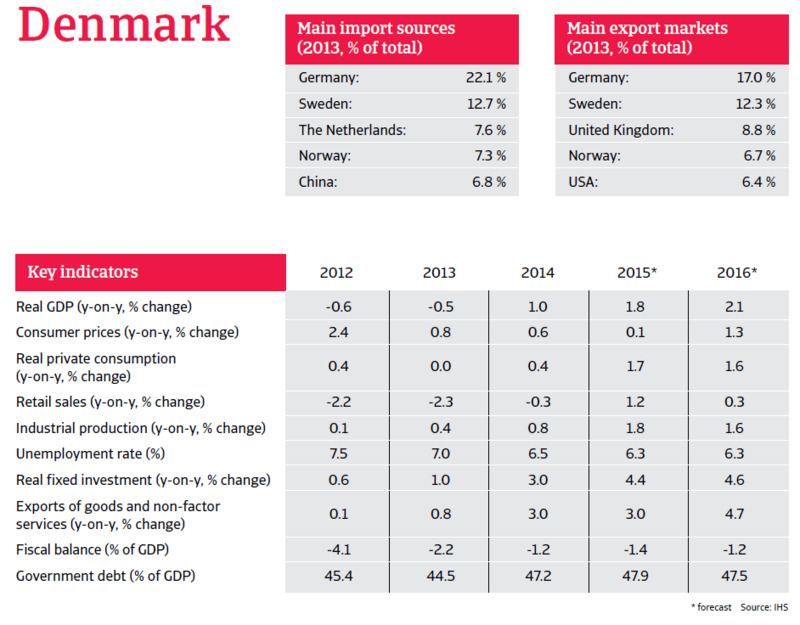 Externally, the Danish economy has regained some of its international competitiveness due to structural reforms that adressed the issue of high labour costs. In order to keep the Danish krone pegged to the (depreciating) euro, the Danish National Bank has repeatedly lowered the main interest rate to -0.75% in February 2015. Avoiding appreciation of the krone against the euro helps Danish firms remain competitive in their eurozone export destinations. The additional stimulus of a devalued euro to eurozone consumers will also benefit Danish exporters through rising demand.